EuroSlots does not accept customers from USA. Check out which online casinos would be happy to have clients from USA. 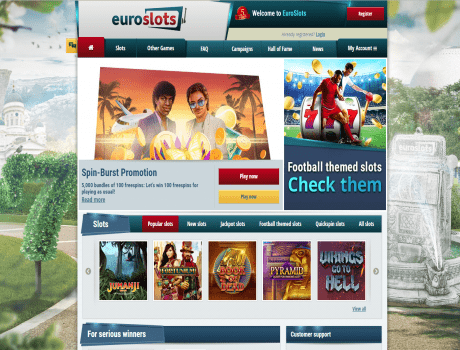 EuroSlots is all about having fun with a European twist. With several decades of experience in both the online and land-based casino sectors, the company certainly knows a thing or two about providing an entertaining experience to players from Europe and beyond. In fact, they recently won the IGA award for Best Online Gaming Operator for the second year running, after beating off some pretty stiff competition to win last year’s accolade too. They strongly believe in keeping things interesting, which is why they frequently create campaigns and newsletters with a humorous theme while giving out generous bonuses and prizes along the way. Welcome bonus In order to reward those players who have chosen to register with EuroSlots. This indicator depends on the variety of ways which EuroSlots offers his clients to contact customer support and the speed with which it solves a problem, as also the overall customer experience. The reputation rating of EuroSlots is based on its popularity in online space - comments, user ratings on other sites, and social networking likes. Did you know you can double your first deposit up to €100? That’s right, you get 100% more to play with by claiming EuroSlots welcome offer. Plus play your first 5 free spins in Starburst at EuroSlots.